“A Vacation State of Mind” – Are you Living there? This weekend I was reading an interesting book synopsis by Laurence Gonzales. I was particularly interested in his new book, which is called Flight 232 and covers the anniversary of a United Airlines flight to Chicago originating in Denver, Colorado that crashed in a corn field. A miracle, 184 out of 296 lived that fire ball of flames. I was suppose to be on that flight that very day. But my daughter had pulled one of her infamous, ‘I am running away’ scenarios and I missed my flight for my meeting with the phone company. Thank you Holli. Or I possibly wouldn’t be here, 25 years later. Mr. Gonzales, I discovered has written several books. So I decided to pick up his older book called Everyday Survival, and Why Smart People Do Foolish Things. Oh this book, I found, is wonderful. I haven’t’ yet gotten in to Flight 232 but this book appealed to me. Having survived cancer (at least to this date) always brings up that question, and certainly when everyone around you is dying, why am I thriving? It’s an interesting way to feel. Its an unanswered question lurking in the back of your mind. Maybe, I am having what he calls “A Vacation State of Mind”. In Everyday Survival, I really connected with the words he said. We often know the storm we are going into…but we don’t look, we are not aware, and we choose foolishly and without using our intelligence to really think these things through. I have felt like that day he had; flying an airplane into an oncoming storm; one that he knew was there but didn’t believe it until the full blown realization that the sky was black and threatening and that it was happening right now. I compare it to the oncologist telling me, yet again this month. My odds in the first place, of getting breast cancer were one in seven. Lucky me! My odds of surviving this ER Positive cancer with surgery and medication is 83%. Without the medication, it is 74%. Without the surgery, I would not have survived at all. So I have a 26% chance, it will return, because I am not taking the oral estrogen inhibitors. I have an even higher chance of a new cancer growing. I think he explained it to me differently before, it was like a 17% chance it would return; but to me that said it was 83% chance of not coming back. I liked those odds and took them. Well…….now I am two years out, I am starting to, like Mr. Gonzales, notice the stormy skies ahead and wonder if I really made the right decision and is it to late to change directions before the hail starts? No hail storm is worth attempting. I have already been through and survived one round. I don’t want another one. I had not even considered this, until I read Mr. Gonzales’ pages. I have gained some awareness, added some knowledge to my data bank of decision making. What fascinates me most is that our society really thinks the same way. We live our everyday lives thinking this way. And we are smart people, but we refuse to see. We refuse to see what lies right in front of us. People die every day for their choices. We make choices to drive to work, in our single cars. We burn fuel like it has no meaning. Yet what is it doing to our earth resources? What is it doing to our pollution? Do we really have to take the car? If all just choose once inawhile, to do it differently, You and I can actually impact our world in a positive way!! Think of that! But back to Mr. Gonzales, he makes a comment to the effect that “understand your rules of behavior”. What guise are we operating under? When I was a kid in school, we were warmed of possible wars and there were bomb shelters. I questioned it then, did we really expect a bomb in our country? We are the United States. This is a safe place. We have a great army, great leaders and we are the strongest country in the world. It took many years, but 911 taught us all that trouble lurks in unexpected places and it comes to visit when and where we least expect it. Of course, it doesn’t happen to us in Seattle, because no one would want to pose a threat here. What would be the point? What was the point in New York? What was the point of the bomb shelter when I was a kid? Did someone see the storm cloud in the future? Our plane flew on into the storm. Trouble is going to find us all in life. Are we going to use our senses, our intelligence, our quiet sense of mind to make our decision to proceed? Or will we react emotionally and chose something foolish? Will there be time to correct our mistake? We are only humans. We think foolishly sometimes. What are we here for? What is the destination, and how are we going to get there? Was there something we missed? Is there something I have missed about my treatment? Am I in a Vacation State of mind? Is this state of mind going to cost me my life? Interesting question. Thank you Mr. Gonzales for charting your course, and in the after effect of writing Flight 232, I picked up your other book. Isn’t it all so interesting, how life goes around full circle? 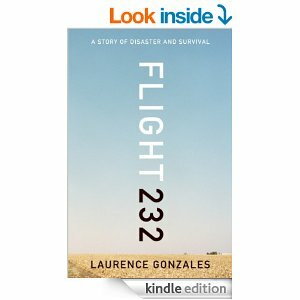 Only not being on flight 232, had me look at Amazon.com and read the synopsis of that book only to find pages of the other book, Everyday Survival, Why Smart People Make Foolish Choices. I do love it, when life sends me these subtle ideas to contemplate. I love life. Living is good. So how is it, we make our choices? What blindfolds do we wear? At what cost? Have a great day blessed day! This summer, be aware of your vacation state of mind. This entry was posted in Uncategorized and tagged breast cancer, choices, Flight 232, hope, Laurence Gonzales. Bookmark the permalink.